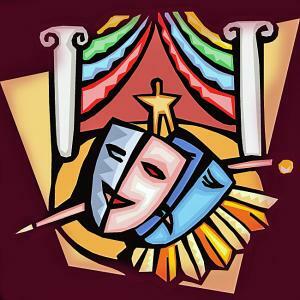 The perfect escape from life's troubles, "�Forum," takes comedy back to its roots, combining situations from the time-tested, 2000 year old comedies of Plautus mixed with the infectious energy of vaudeville. The result: a non-stop laugh-fest in which a crafty slave (Pseudolus) struggles to win the hand of a beautiful but slow-witted courtesan (Philia) for his young master (Hero), in exchange for freedom. Southside Theatre Guild's "A Funny Thing..." makes a few unusual casting choices: Pseudolus is played by a woman; Hysterium is played by a woman; Gymnasia, an Amazonian woman, becomes Gymnasium, a hunky man; Marcus Lycus is played by the onstage keyboardist; the directors take on roles too. The only choice that really doesn't work is making Hysterium a woman. The humor of a man being forced to dress up as a bride becomes a bit strained when the humor is forced to be of a somewhat plain woman getting gussied up. The fact that the pronouns referring to the characters aren't always changed to reflect the performer's gender adds to the gender blurriness. The performances and voices are generally good. Highest marks go to Jennifer Waldman as Domina, who establishes a strong character from her first word and effortlessly makes her way through "That Dirty Old Man," a song whose vocal range and speed can't be easy to navigate. David Azzarello also provides a strong character and wrings more comedy from the character of Miles Gloriosus than is usual, with his blubbering face bringing lots of laughs. He seems to be more a baritone than the bass-baritone the role calls for, so vocal volume isn't what it always needs to be, but that's a minor quibble. None of the other actors land quite as strongly on their characters, although a number make favorably strong impressions. Diane Mitchell brings incredible energy and stage presence to Pseudolus, along with a terrific voice. It's not her fault she's been cast in a role better suited to a Borscht Belt comic, and she does all she can to add comic bits into the mix. Jason Lindsey brings a goofily awkward presence to Hero, which works well with his pairing with sweet-faced Haley DeVaney as Philia; both have lovely voices and a nice chemistry. Amanda Lindsey makes a strong impression as Vibrata, with some very cute business with Pseudolus scratching her behind the ear. Missy Gossett has a strong voice as Hysterium, but can't wring all the comedy available in her role. Jill Lucas, on the other hand, has a natural comedic flair that she puts to good use in her number of roles as a Protean. Accompaniment is not strong. The brass is often sour enough that I sometimes marveled at how singers could find their starting pitches. The singers drive the musical numbers, with the accompaniment sometimes limping along behind. The performers are generally stronger than the production itself. The set isn't the usual three Roman housefronts in a row. Here, we have porticos right and left for the two most important homes and a doorway with columns far stage left for the residence of Erronius. The center right of the stage is filled by the four-piece band, while upstage a sky-blue curtain hangs. Downstage, a two-sided ramp is built in front of the stage proper, allowing additional intimacy when the action is staged there. The stone painting on the ramp and stairs is terrific, but otherwise the set is a disappointment. There's little style in it, although it does prove to be functional. Costumes are also functional, with occasional flair, and a lot of effort seems to have gone into them.